Been away for a bit but I'm back today with an amazing hair look that is lovely for the summer days ahead! Whoo Hoo! On the blog now is my review and look I created with Hot Tools 1" Marcel Iron -24K Gold, which was gotten from Beauty Stop Online. Beauty Stop is a website that carries lots of beauty products ranging from hair products, nail polishes, Cosmetics products and so on. When I was contacted to give my honest review of a product they carry on their website, I chose the Hot Tools 1" Marcel Iron. Here's a quick collage that tells the story of how I used this iron, but please keep reading for lots more! 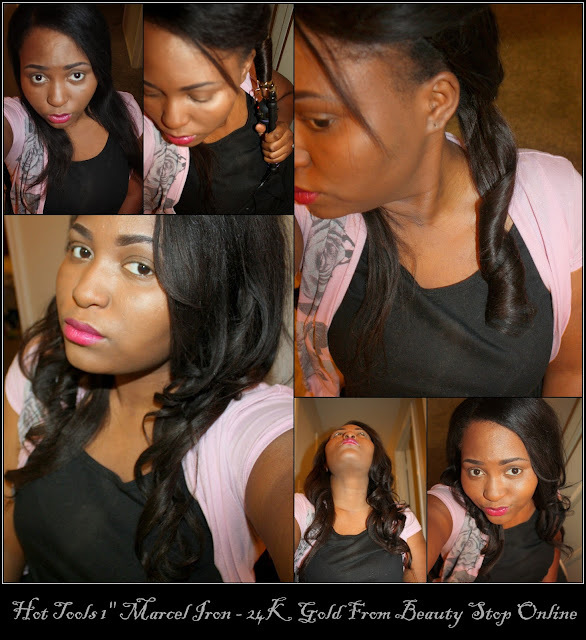 I don't usually apply heat on my natural hair, but whenever I sew in weave (human hair), I love to curl, straighten and do all sorts of stuff to the weave! I never actually found a curling iron I have falling in love with, so I had been looking for something affordable (Yes, I mean Cheap), that will do the work perfectly! I did a research on this curling iron before I decided to settle for it and I must say, I am a happy camper. I've had this curling iron for over a month because I believe in true honest and detailed reviews if it's an investment such as this one. I have put it to TheDIY Test, and I am glad to report it passed. lol. The Marcel Iron definitely takes some getting used to if you've always used the spring type of curling iron. But I must let you know, the Marcel makes your job faster, and you will be able to curl a full head in a shorter period of time, while having control on exactly how you want the curls you create to turn out. This 1" Iron allow for big bouncy curls that are perfect for summer. I started with straight hair.. and brought out my CHI Heat protector. Even though the majority of hair on my head is weave, I still wanted to protect it from heat. Then I pinned up my hair and curled in small sections from the bottom to the top. I held for about 30 seconds in each section. Result below. Since I wanted the curls a bit loose, I used my fingers to separate them a bit and Voila. No combing, just my fingers. The result made me very very happy! Loose and soft curls!! I didn't use any other hair product aside from the CHI heat protector. I got frustrated when I first used this curling iron. So frustrated that I sighed and almost wrote a bad review and contemplated sending the product back. Everything about it was very new to me, and I couldn't hold the iron properly. See, the only kinds of curling iron I've used are the spring type. Welp, I calmed down and whipped out the manual. I read what it said about letting the iron stay on for a bit before using, and then I read all the other stuffs We ladies usually ignore! And Boom, like magic, the iron worked perfectly. I also watched THIS AMAZING VIDEO on youtube that helped me so very much, even though I eventually figured out how to hold the iron my own way. As you can see in the image above, the heat can be turned all the way up to 430 degree F.
After the first 2 uses, it heats up really really FAST! I mean about 10 seconds! The curls this 1" iron creates are big and come out bouncy. For the curls in the pictures above, I had the iron on 380 degrees. I am pleased with this curling iron and I'm glad it's affordable through Beauty Stop Online. They carry some lovely products at amazing-can't-beat-it prices! *whispers* China Glaze polishes at $3.99 each on there! If you're interested in this Curling iron, or other beauty products at great prices, Check out Beauty Stop on their Website, Facebook, and Twitter pages. Hair (weave): Milky Way Que in Yaky Weave. 18 and 16 inches. Just two packs. That's it for now my loves. Summer is officially here and I hope you all are enjoying yourselves!